As flames engulfed the Royal Clarence Hotel in October 2016, it was hard to imagine that any good might come from the shocking destruction. Yet its effect has been to heighten awareness of those historic buildings at the heart of Exeter which have survived previous fires, enemy bombs, decay and redevelopment. 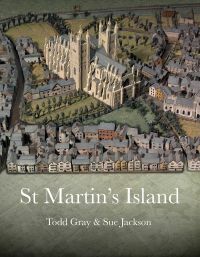 This volume, commissioned by Historic England, discusses the buildings of St Martin’s Island, a term coined after the Royal Clarence fire for a rectangular block of land just across the Green from Exeter Cathedral, bounded by the High Street, Broadgate, Cathedral Yard and Martin’s Lane. The book’s authors, Todd Gray and Sue Jackson, use a wide range of evidence to present a fascinating account of the changing face of this part of the city. Brief histories are given of the main thoroughfares, before descriptions are offered of individual sites and buildings – from a tradesman’s home and shop of 1564, wherein are preserved late sixteenth-century wall paintings, to a four-storey Georgian building with a richly carved frontage in Elizabethan style, added in 1907 in accordance with Boots the Chemists’ policy of ‘drawing on the past to boost prestige’. Importantly, the authors ‘people’ the island, so that this is not a dry account of built fabric, but an accessible, often entertaining, and sometimes poignant, record of the ways in which the built environment has responded to social change. The book is lavishly illustrated with plans, maps, drawings, paintings and photographs; all beautifully designed by Topics – The Creative Partnership, Exeter. The authors conclude with a plea for the present generation to learn from the past, particularly from mistakes made in the 1960s and 1970s when too many of Exeter’s historic buildings were lost needlessly. This well-researched and thoughtful volume acts as a timely reminder of the richness and fragility of those that survive.